Flowmaster 942551 - 50 Delta Flow Muffler Offset In/Center Out: 2.5"
Flowmaster 842551 - 50 Delta Flow Muffler Offset In/Center Out: 2.5"
21502 is rated 5.0 out of 5 by 1. 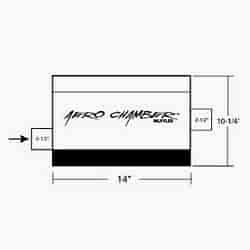 Rated 5 out of 5 by Pete 14 from Aero chamber mufflers Order was processed with the wrong address, but was corrected by the Jegs staff quickly and on a Sunday. the mufflers are really quiet at idle but a little to raspy under acceleration. They are much quiet than straight pipes though. Happy so far.